Radioactive decay is where the atom of an unstable element can decay into another type of element, releasing energy in the process. One process by which this can occur is known as beta decay. When beta decay occurs an element such as caesium decays to barium. This process releases an electron, first known as a beta particle, hence the term beta decay. But there was something rather strange about beta decay. The mass of a barium atom is less than the mass of a caesium atom, and Einstein had demonstrated that mass can be transformed to energy and vice versa. So the amount of energy released during the decay should simply depend on difference in atomic masses of the two elements. This meant the energy given to the electron should always be the same. But experiments demonstrated that the electron could have a wide range of energies. What was going on here? One proposal, made by Niels Bohr, was that conservation of energy only held true on average, so that variations in the electron energies were due to some quantum fluctuation. However Wolfgang Pauli proposed the existence of an additional particle. Thus beta decay must emit both an electron and a small uncharged particle we now call the neutrino. Pauli proposed calling it the neutron, but between the time he proposed the idea and the time it was accepted the particle we know as the neutron was discovered. So Enrico Fermi proposed the name neutrino, which is Italian for “little neutral one”. Pauli proposed the neutrino in 1930, but its existence wasn’t solidly confirmed until 1956. Neutrinos interact very weakly with other particles, so it took a nuclear reactor to produce enough neutrinos to be detected in the lab. Modern neutrino observatories, sensitive enough to observe solar and astrophysical neutrinos, are large arrays of detectors. One example is the Super-Kamiokande detector seen above. The three technicians on the left give you an idea of scale. Neutrinos are not only produced in radioactive decay, they are also a byproduct of nuclear fusion. Thus the Sun produces neutrinos in its core due to the fusion of hydrogen. These solar neutrinos were detected in the mid 1960s, but it was found that the number of neutrinos was a third the expected amount. This result was repeatedly confirmed, and it became known as the solar neutrino problem. The solar neutrino problem meant either our understanding of the temperature and pressure within the Sun was significantly off, or our understanding of particle physics was wrong. Since our understanding of particle physics was based upon laboratory experiments, it was thought that our Solar model must be wrong. There were several attempts to reformulate solar fusion models to account for the smaller neutrino rate, going so far as to propose that fusion in the Sun’s core had shut down temporarily. But over time these alternatives became increasingly untenable. Observational data supported traditional solar fusion models, therefore our understanding of particle physics must be wrong. The physics of fundamental particles (electrons, neutrinos, quarks, etc) is described by what is known as the Standard Model. This model unified our understanding of electromagnetism and the nuclear forces known as the strong and weak. It described all known elementary particles, and even predicted new particles that were eventually observed. By the 1970s it was established as the theory of fundamental particles. In the 1960s, it was found the the electron had two sister particles known as the muon and tauon, (together known as leptons) and that each of these had a corresponding neutrino. This meant that there were three types (or flavors) of neutrinos. According to the standard model, these neutrinos should be massless. This would mean that each flavor of neutrino only interacted with its corresponding lepton. The reason for this is that massless particles travel at the speed of light. They therefore don’t experience time, and can’t change their state. So a muon (which has mass) can decay into an electron, but a muon neutrino cannot change into an electron neutrino. In 1968 Bruno Pontecorvo proposed that neutrinos had a small mass. This proposal would change the standard model slightly, but leave the overall predictions largely unchanged. The mass of the neutrinos couldn’t be large, otherwise they would have already been observed. But even the tiniest amount of mass would mean neutrinos could not move at the speed of light, and could therefore change flavors. This flavor-changing effect is known as neutrino oscillation. Neutrino oscillation would explain the solar neutrino problem. The neutrinos produced in the Sun’s core would all be electron neutrinos, but as they moved through the Sun to its surface they would oscillate between the various types. By the time they reached the Earth, the neutrinos would be an equal mix of each type, meaning that only a third would be electron neutrinos. Since only the electron neutrinos were measured, the neutrino number would be a third that predicted by the standard model. 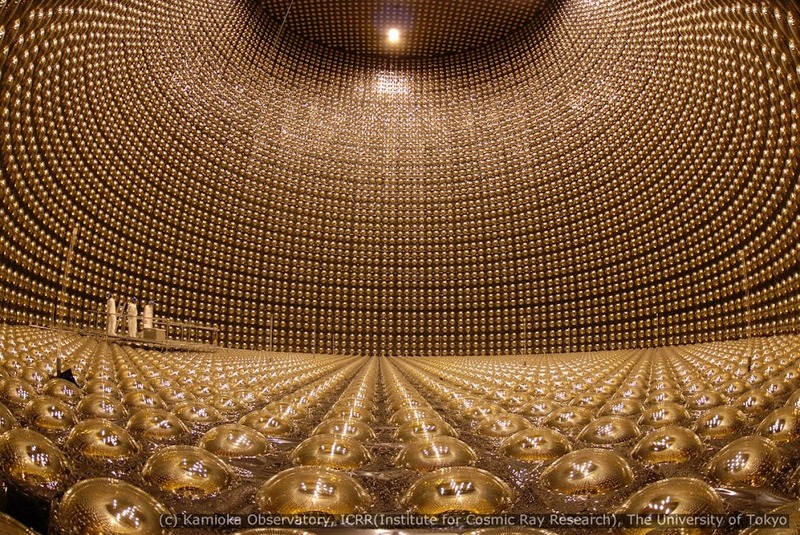 It wasn’t until 1998 that neutrino oscillation was confirmed by the Super-Kamiokande detector seen below. Thus the solar neutrino problem was resolved. It also demonstrated that neutrinos do indeed have mass. Just how massive they are has yet to be precisely determined, but we have a general idea from cosmological observations. Moments after the big bang, the initial electrons, photons and neutrinos of the universe were produced. This means the number of neutrinos in the universe is related to the number of photons. We can calculate the photon number by observing the cosmic microwave background, so we have a good idea of the number of neutrinos in the universe. If the neutrinos had a larger mass their gravity would affect the distribution of galaxies. Galaxy surveys see no such effect, which means the total mass of all three neutrino types can be no more than 0.23 eV, or less than 2 millionths the mass of an electron. Observations of neutrino oscillations also require that at least one flavor of neutrino has a mass of at least 0.04 eV. Because neutrinos have mass and weakly interact with other particles, they are often brought up as a possible solution to dark matter. However neutrinos have such a small mass that they cannot be the solution to the dark matter problem. They might contribute in a minor way, but they aren’t the complete solution. So while we’ve solved the mystery of one “little neutral” particle, there is another particle mystery waiting to be solved. So, if a particle with mass can not travel at speed of light. It mean that we can not produce a machine that can travel at speed of light. So how can we get to another sun or exoplanet.